Last year, more diseases from tick bites were reported than ever. While it’s possible that warmer winters (which cause tick populations to boom) and an expanding tick territory are responsible, it’s also possible that awareness has gone up in recent years causing doctors and patients to report more incidents of tick bites and related diseases. Now’s the time of year when many discover they have a tick borne illness. 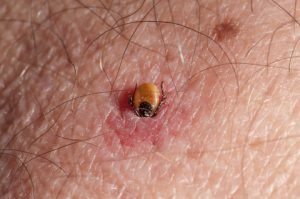 While some may discover it right away in the summer months, either owing to carefully tracking their body after a tick bite or getting the less common tell-tale bulls-eye rash from Lyme Disease, many only notice after the disease has incubated a few months. Symptoms of Lyme Disease include fatigue, aching joints (it takes a while for Lyme Disease to spread to joints) and general malaise. Because of the resemblance to flu-like symptoms, it may be hard for doctors and patients to reach the conclusion that it’s Lyme Disease or one of the other similar tick borne illnesses. Adding to the confusion, Lyme Disease as well as other tick borne illnesses are spreading across the country, and doctors (and patients!) may be unaware that they live in a county with tick borne illnesses like Lyme Disease. If the tick bite happened early in the summer, it’s also highly possible it went unnoticed. At that time, ticks are in a stage where they’re tiny—only about as big as a poppy seed. -A warm winter means more ticks in the spring. -Tall grass and wild mammals (from mice and voles to deer) mean ticks—don’t welcome them into your yard. -Both humans AND pets need watched for tick bite, and the symptoms of Lyme Disease. Pets can bring ticks into the home, and a sudden downturn in energy could mean Lyme Disease. Make sure that any ticks you remove are brought to a doctor or vet. You can also proactively support your immune system with colloidal silver. If you think you might have Lyme Disease or another tick borne illness, see a doctor right away. Fall is the time of year when many realize they have the symptoms, even if they haven’t been in nature since the summer when it was warmer.